These three small words have the power to dramatically change your existence. They can set in motion events that leave you - the patient - feeling out of control of your own body and circumstances. And while there are still many mysteries about cancer, it's important to understand the illness and how it will affect your life. With her trademark wisdom and warmth, Ranjana Srivastava guides you through the challenging and complex world of the disease. What is cancer and how is it treated? Why can't I have an operation? What should I eat, and how do I manage pain? She equips you with the knowledge to make informed decisions on the most daunting questions, such as how to find the right oncologist, and how best to break the news to your family. So it's Cancer: Now What? 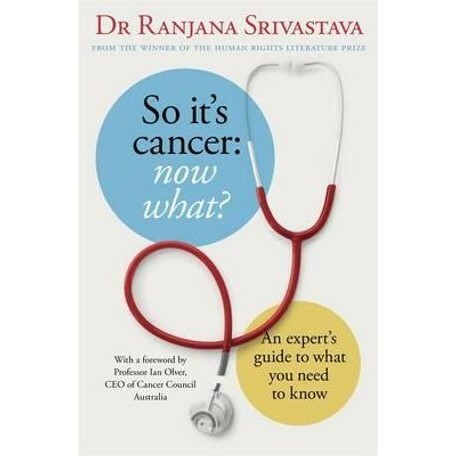 Is a practical, comprehensive guide to what to do when cancer enters your life, by medical oncologist and award-winning author Ranjana Srivastava. Dr. Ranjana Srivastava was educated in India, the United Kingdom, the United States and Australia. She graduated from Monash University with a first-class honours degree and several awards in medicine. In 2004 she won the prestigious Fulbright Award, which she completed at the University of Chicago. Ranjana is now an oncologist and educator in the Melbourne public hospital system. Ranjana's writing has been featured in Time, The Guardian, The Week, New York Times, The Age and Best Australian Science Writing, and in numerous prestigious medical journals including the New England Journal of Medicine and The Lancet. In 2008 her story 'Ode to a Patient' won the Cancer Council Victoria Arts Award for outstanding writing and in 2012 Ranjana won the Nossal Global Health Prize for writing. She has published two books: Tell Me the Truth, which was shortlisted for the NSW Premier's Literary Award, and the warmly received Penguin Special Dying for a Chat, which addresses the lack of communication between doctors and patients. Ranjana lives in Melbourne with her husband and three young children.